Normally, when our esteemed umpires throw someone out of the game, it's done with a flair and excitement that fans of both sides can usually get behind. 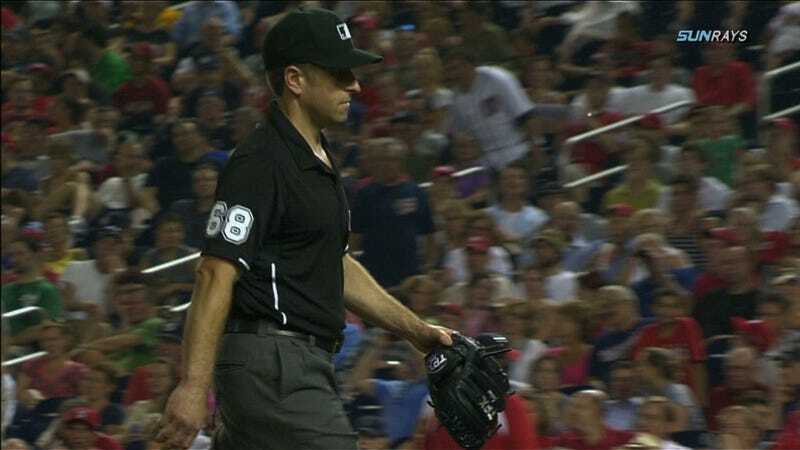 But when the umpiring crew in tonight's Nationals-Rays game discovered a "foreign substance" on the glove of Rays reliever Joel Peralta, the result was, thanks to home plate umpire Tim Tschida, easily the most boring, lackadaisical, and downright orderly MLB ejection we've ever seen. While I'm not much for conspiracy theories, the only rational explanation here is that Peralta used to pull these shenanigans when he was with the Nationals two years ago. Peralta hadn't even thrown a pitch in tonight's game when the umps came out to check his gear, so it's not like the Nationals hitters were complaining about any funky mid-air movement. Nope, this smells like pure gamesmanhip from DC, but that's what Natitude is all about. As he left the field, Peralta tipped his cap in the direction of the Nationals dugout. Yeah, he knew what was up.